There is no such thing as "The Truth". Truth is something relative, closely related to peoples beliefs. One persons truth, may be another persons lie. People believe things to be true if they do not know the facts, they believe (as opposed to know) people are not telling the truth if they do not agree with their own inadequate understanding of the facts. Throughout human history, society has developed procedures for mediating disputes between people and groups of people. In the main, society has progressed and civilisation advanced; for example, genocidal wars have been largely replaced by international diplomacy as a way of dealing with problems between nationalities. During the history of civilisation, society has had to deal with modern problems - pollution, outbreaks of new diseases and peoples alienation in an increasingly impersonal, consumer driven world. "The Law" is the foundation of modern society, the means by which it is ultimately controlled. The Law has not stood still while society has developed in leaps and bounds, it has had to accomodate change. But, because the Law is inherently conservative, it cannot keep chopping and changing and is responsible for bringing stability and security to society as a whole, it is often forced to change after everything around it has moved on, after much argument by politicians. Laws are passed not so much to introduce change, but more to catch up with the changing world. For example, after the discovery of DNA, new laws governing genetic engineering had to be introduced. Criminal law is the area of law which deals with the wrongs committed by individual members of society. We are not concerned here with the rights and wrongs of criminal law, and who's interests it serves, but with its administration - the way it works. Britain's adversarial system of justice attempts to understand the truth by bringing the two sides of a dispute together to argue about the facts in a court of law. It is then for the court to decide which side is supported by the facts, which side the court believes is telling the truth. In criminal law, the prosecution and defence exmamine their witnesses and cross examine the other side's, and present their evidence for the court, whether a magistrate or jury, to decide the facts. In this pamphlet we have not uncritically presented the defence case in order to show that Malcolm Kennedy is the victim of a miscarriage of justice. We have attempted to go deeper. We have taken a look at the administration of justice in this case and concluded Malcolm Kennedy did not receive a fair trial and Patrick Quinn's attackers have avoided prosecution. We are not saying that the CPS broke the rules to withold evidence from the defence, they may well have, we have said the system denied Kennedy a fair trial. When dubious decisions were made, we have given police officers and the prosecution the benefit of the doubt. We have said they need not have been involved in a conspiracy to pervert the course of justice. We have been more than fair to the prosecution. It may appear that we have been unfair to Malcolm Kennedy's defence. By excusing the prosecution, perhaps readers will think we are critical of the defence; that Mansfield placed too much emphasis on PC Giles as the prime suspect. Michael Mansfield QC has written a book "Presumed Guilty", in which he described the same fundamental injustices in the judicial system which denied Kennedy a fair trial. Michael Mansfield QC is as much a prisoner of the adversarial criminal justice system as any other lawyer, and Malcolm Kennedy received an unfair trial regardless of the outcome. In order to win their case the defence had to leave no stone unturned in suggesting to the jury that a police officer killed Patrick Quinn. Even if he had not been convicted of manslaughter, Kennedy received an unfair trial and in the last four years has had to endure one injustice after another which has left him rotting in prison and his life destroyed. Society is presently in a constant state of change. Radical changes are taking place throughout the world and in Europe, independent nation states, many of them only recently formed, are having their sovereignty undermined as they prepare for the creation of a superstate. In Britain, the last 20 years have seen immense stresses and strains placed on its political infrastructure. Our institutions have been transformed and they are still unable to cope. For the criminal justice system there have been two Royal Commissions in the last 15 years, set up to examine its failings. Twenty years ago, police officers fabricated evidence against a host of Irish people who were convicted of terrorist offences and sentenced to long prison terms. It took 17 years for the Guildford Four and Birmingham Six to clear their names, and during that time many more miscarriages of justice occurred. The history of these cases has had an impact on the national consciousness, they caused immense public concern with the efficiency of the criminal justice system. And, how the police, the courts and the government have responded to the crisis in the criminal justice system is also affecting what people think. There have been three responses to the celebrated miscarriage of justice cases - by the police, the courts and the government. In general terms, the police have tried to maintain that miscarriages of justice did not take place, that officers were placed under immense public pressure to catch those responsible for atrocious crimes and ignored procedures in their hurry to solve the cases. According to the police, they cannot be held responsible for the criminal justice systems inadequacies. Very few of the police officers involved in the massive conspiracies to pervert the course of justice have been criminally charged, fewer have actually been tried, and none have been convicted. Criminal prosecutions of police officers are the other side of the coin to the prosecutions of their victims. The CPS prosecutors and police investigators are not independent and impartial, and trials against police officers have been reduced to courtroom farce. The government response to the crisis in the criminal justice system was to set up the Royal Commission on Criminal Justice following the release of the Birmingham Six in March 1991. In separate developments, responsibilities for control of the police and the role of local police authorities were re-examined by a White Paper and the Sheehy Inquiry proposed radical changes to police management. The end product of these investigations were the Police and Magistrates Courts and the Criminal Justice and Public Order Acts which received the Royal Assent this year. The sum total of these two pieces of legislation has been to increase the powers of the police and erode civil rights, most particularly the right to remain silent on arrest (and more of the same legislation is planned for the near future). The Malcolm Kennedy miscarriage of justice case is not the same type as the celebrated cases. Society has moved on 20 years and so have the police. As conscious human beings, police officers have noted what happened after Guildford and Birmingham - management stood by them, nobody was convicted and their powers have increased. Today, not only do police officers have the confidence to fabricate evidence against suspects they believe to be guilty (like when Colin Stagg was "planted" with a sexual fantasy in the Rachel Nickell murder enquiry), they are fitting people up to cover up their own crimes. The Malcolm Kennedy case has more in common with 1990's style police crime than with the wrongful convictions of the more recent Tottenham and Cardiff Threes. The Hammersmith officers who attacked Patrick Quinn are on a par with the Stoke Newington police officers involved in organised crime, supplying drugs and running a protection racket. Not one of the Stoke Newington officers investigated by a three year long complaints investigation, codenamed "Operation Jackpot" has been charged with a drugs or extortion offence. They successfully used the criminal justice system to avoid prosecution for their crimes, and falsely accused many innocent people in the process. Like Kennedy's case, many of the Stoke Newington drug squad victims trials were reduced to a question of credibility - who is telling the truth, the police or the defendant? The police's victims were let down in the same way by an adverserial criminal justice system dependent on the police playing a professional and impartial role. These are the new kinds of scandals which are rocking the British police. Over the years many more cases will arise in the same way that more Guildford and Birmingham type cases came to light. If, 20 years ago police officers framed innocent people believing them to have committed crimes, and today they are fitting up innocent people to cover up their own crimes, in 20 years time will police officers be committing crimes without bothering to tidy up after themselves? When Malcolm Kennedy learned at the start of his second retrial on 21 February 1994 that the Crown Prosecution Service was witholding PC Paul Giles from giving evidence, he was devastated. He knew then he would not receive a fair trial. Malcolm discussed the situation with Hackney Community Defence Association, and it was decided to hold a picket of the Old Bailey on the morning of Monday 28 February. On Friday 25 February, a news release was issued giving background information on the judge's ruling to exclude Giles (see appendix). Also on the Friday, Michael Mansfield QC made his opening speech to the jury outlining the defence case. True to form, Mansfield made an excellent speech which Malcolm found reassuring. This placed Malcolm in an extremely difficult position. He was the defendant in what amounted to a political trial against the police. Should he force the issue with a public demonstration against his being denied a fair trial, and make the trial even more political and perhaps turn the jury against him? Or should he rest his hopes on his defence, and the jury seeing through the CPS's manoeuvrings? Understandably, Malcolm decided to be cautious and the picket was cancelled. However, Malcolm was so concerned about what happened he sent copies of the news release out with letters to people who had supported him during his three year ordeal. One of those people sent a copy to the trial judge, who also learned of the news release form a court usher who had seen a journalist in the press gallery with a copy. Judge Swinton Thomas was not too pleased with the contents of the release and ordered that the person who sent him a copy, and its authors, should answer for themselves in court. On-March two members of HCDA and their counsel attended Court 4 at the Old Bailey to hear what the judge had to say. We were tempted to go into the witness box and discuss the case with him, but on counsel's good advice we resisted the temptation and Judge Swinton Thomas huffed and puffed. But he did not blow the house down! "The CPS's decision not to call Giles, which has been supported by the trial judge, undermines the administration of justice. It has caused a constitutional crisis in law and has denied Malcolm Kennedy the right to a fair trial." As has been said in this pamphlet, we believed the CPS put the judge in an impossible position. It would appear that Judge Swinton Thomas agreed. Malcolm's manslaughter conviction took HCDA by surprise. Before the end of the hearing, the jury had informed the judge they were divided and would need time to agree a verdict. Arrangements were made for the jury to stay in a hotel. Malcolm was denied bail during the jury's deliberations and was ordered to stay in a hotel with his lawyer, Tim Cooke. Apart from a few phone calls he was unable to discuss at any length what he wanted to do after the jury reached its verdict. HCDA had three news releases ready for when the jury reached its verdict - not guilty, guilty or a hung jury. A fourth release had to be quickly compiled when the jury reached its manslaughter verdict in the late morning of 6 May. We had to respond quickly, and at 4.00pm that same afternoon HCDA picketed the head offices of the CPS on Ludgate Hill, just a stone's throw from the Old Bailey. The picket was briefly shown on BBC television's national news. We were pleased, Malcolm would go into prison knowing there was somebody fighting for him on the outside. Before the start of Malcolm's 11 week trial, HCDA had written to several MPs who had supported him in the past to keep them informed of what was happening. Before the end of the trial, another letter was sent out asking them to express concern about the case irrespective of the outcome. On 10 May, seven MPs signed a House of Commons Early Day Motion expressing concern with the case - Chris Mullin (who had done so much in support of the Birmingham Six), Clive Soley (MP for Hammersmith), Diane Abbott (Malcolm's MP), Andrew F. Bennett, Jean Corsten, Stephen Byers and Brian Sedgemore. Eventually over 60 MPs signed the motion. On 23 May, Chris Mullin MP asked a parliamentary question of the Attorney General concerning the court's decision to allow the CPS to go against the Court of Appeal's ruling that a fresh jury should hear all of the evidence. The Attorney General, Sir Nicholas Lyell, declined to answer saying it was for the independent courts to decide on such matters. Returning to prison has been hard for Malcolm Kennedy. It is the isolation which is the worst, wanting to do so much, but able to do so little. But he has organised an extremely important letter campaign from inside prison, and is determined to continue his campaign after his release from prison if need be. His grounds of appeal against the manslaughter conviction were lodged by his lawyers on 3 June 1994. Shortly after Malcolm's conviction, HCDA was approached by members of Hammersmith and Fulham Irish Community Forum. Some of their members knew Paddy Quinn and were sick and tired of Irish people being arrested by Hamersmith police, being stereotyped as drunk and disorderly and getting beaten up and thrown back onto the streets. They wanted to campaign against police crimes against Irish people and justice for Patrick Quinn. A well attended public meeting was held at Hammersmith Town Hall on 13 July 1994. Islington MP, Jeremy Corbyn, addressed the meeting as well as speakers from HCDA and the Hammersmith and Fulham Irish Community Forum. It was a significant event which demonstrated the unity of the two parties who have suffered so much - Patrick Quinn and Malcolm Kennedy. 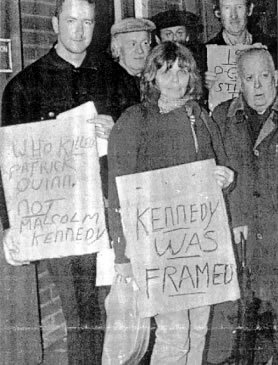 At that public meeting, the Free Malcolm Kennedy, Justice for Patrick Quinn Campaign, decided to hold regular pickets of Hammersmith police station until Malcolm is released from prison. On the first Monday of every month, 6.00pm - 7.00pm, people have picketed the station and leafletted passers by and commuters at the nearby Hammersmith tube station. Slowly but surely we are building a campaign which will ensure this case will not go away. Two people and their familes have suffered greatly as a result of what happened in Hammersmith police station in the early hours of December 1990. Patrick Quinn lost his life and Malcolm Kennedy ost his liberty. We also have no doubt that police officers were traumatised by what happened and their families have also suffered. The officers have received impressive support from the police, Patrick Quinn's family and Malcolm Kennedy have had to endure their suffering very much alone and in isolation. This story of injustice has affected their lives very deeply. "Patrick Quinn was taken into Hammersmith police station, tragically he was brutally killed. I was taken into that same police station and "fitted up" for his murder. Since that fateful night my life has come to an end. I'm very upset about the death of Mr Quinn, nothing has affected my life so deeply, if it was in y power to change things I would. As it is, those responsible have got away with it and I am rotting in prison. I try not to let bitterness and resentment creep into my thoughts, however, my anger at the way my life has been sacrificed to save a few rogue policemen remains." A short history of socialist and anarchist Yarmouth in the late 19th century.